The Samsung brand is best known for high-end consumer electronics, but a new pilot scheme in South America suggests it might have something to offer in the field of road safety, too. Last week (February 2nd) saw the launch in Argentina of the Samsung Safety Truck – a prototype described by the South Korean tech giant as “a technology … which seeks to prevent road accidents in overtaking situations”. Created by Samsung in collaboration with Volvo, advertising agency Leo Burnett, and Argentine companies Ingematica and Helvetica, the Samsung Safety Truck is a HGV fitted out with an array of cameras and screens to solve the problem of other motorists’ views being obstructed by the vehicle. A pair of front-facing cameras are used to capture an image of the road ahead, which is then transmitted in real-time to a rear-mounted video wall comprised of four Samsung OH46D screens. Each OH46D is 46 inches on the diagonal and supports resolutions of up to 1,920 by 1,080, making for a 92-inch (2.34 m), 4K surface. Moreover, each screen is dustproof and waterproof, and IP56-certified “for superior performance against even the most challenging environmental conditions”, Samsung claims. Sang Jik Lee, president of Samsung Electronics Argentina, described the truck as “an invention that we believe will change the history of road safety”. 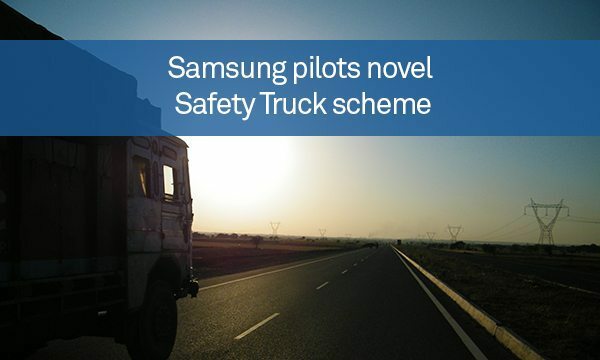 The Samsung Safety Truck pilot will run for one year.